EVH & Gear TV is a weekly EVH Talkshow sponsored by Stewart Travel Guitars, RØDE Microphones & vanhalenstore.com Regular episodes air every Friday at 9PM EST. Hosted by EVH Gear Artist, Eric Broadbent. Subscribe on YouTube for content notifications. Looking for full service multimedia production? Visit my company Design39Media today. We also pay commission for leads! DON’T MISS A SINGLE LIVE INTERVIEW OR CONTEST! 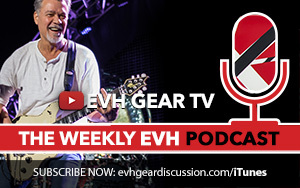 GET THE EVHGEAR TV NEWSLETTER! Be the first to get latest guest updates and contest info straight to your email inbox. We do not spam!